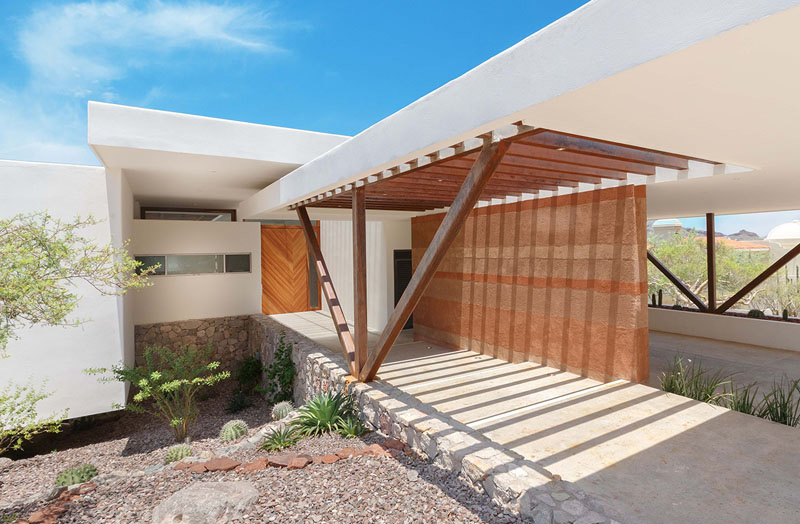 A stunning modern home has rammed earth wall and you'll be amaze with the view! 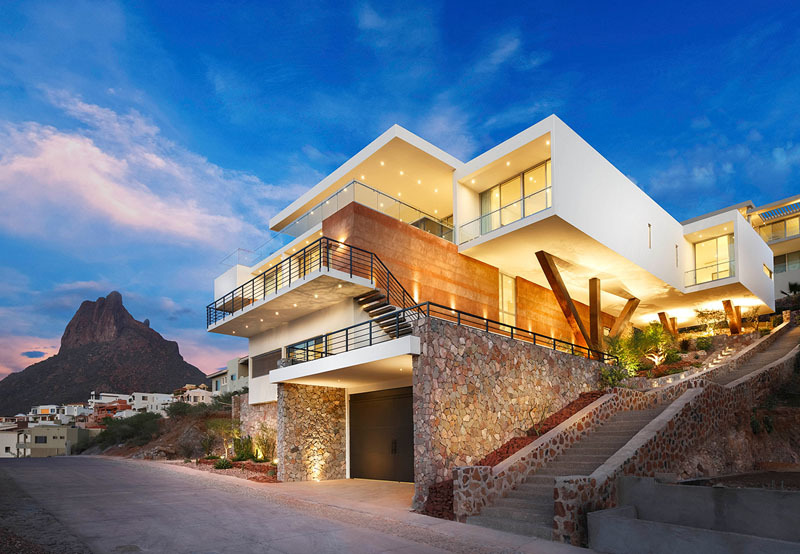 This won’t be the first time that we will feature a house that sits on a sloping topography. It won’t be the first time either that we will show you a home with stunning views. 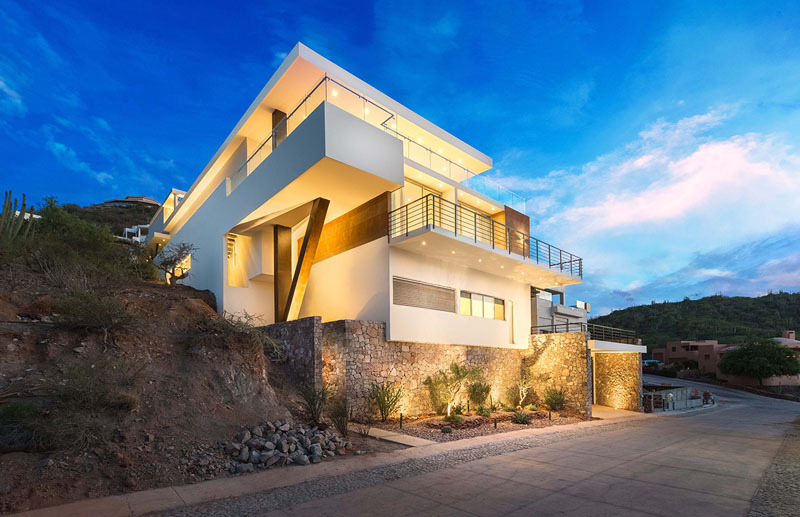 But for sure, this is the first time that you will see an extremely gorgeous home with a unique design sitting on a slope overlooking a breathtaking view of the neighborhood of the mountain. Indeed, nothing beats a lovely view from the home. 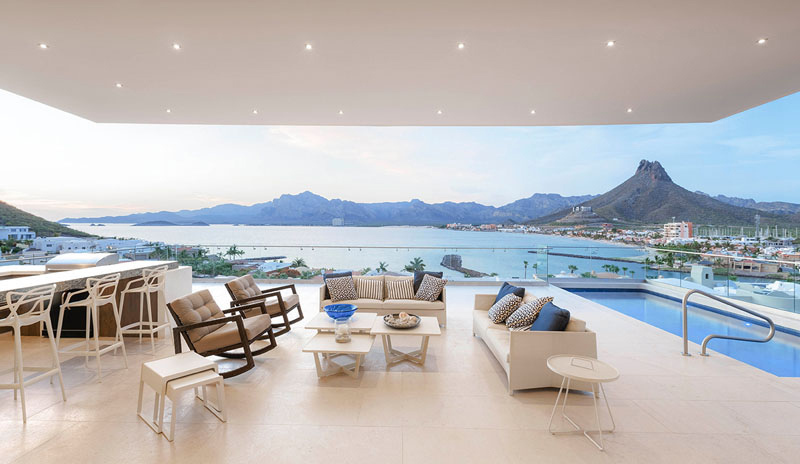 This project is called Casa Sal which is defined by Imativa Arquitectos as “the integration of the physical environment – natural and room concept of a regional project basis.” Indeed, you can see natural elements in the house and the layout in the interior is very impressive making it easy to access the different areas of the house. Aside from that, you will surely love the outdoor area where you can find an outdoor kitchen with a grill, a lovely outdoor set and a pool area. Once you are here, you can take a look at the waters and the mountains which is definitely breathtaking. I am sure you will agree with me that this house is indeed something that will certainly fit into one’s standards for a dream home. 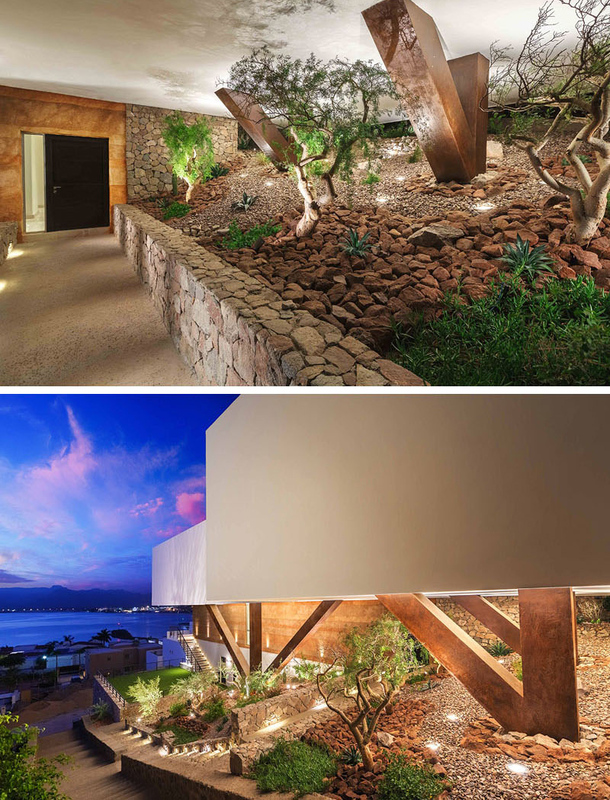 Let us examine the different parts of Casa Sal located in Mexico through the images below. Unique feature: Natural and room concept was integrated for the design of this beautiful modern home with rammed earth walls. You can see in this image that the house is indeed located on a steep location. The stairs that lead to the entrance of the house has beautiful stones on its sides and you will surely be pleased to look at the gardens found in various parts of the house. Seen here is the other side of the house with steel features that was also used on one side of the structure where you can see the garden. In the lower portion near the garage is another lovely garden with dramatic lighting. 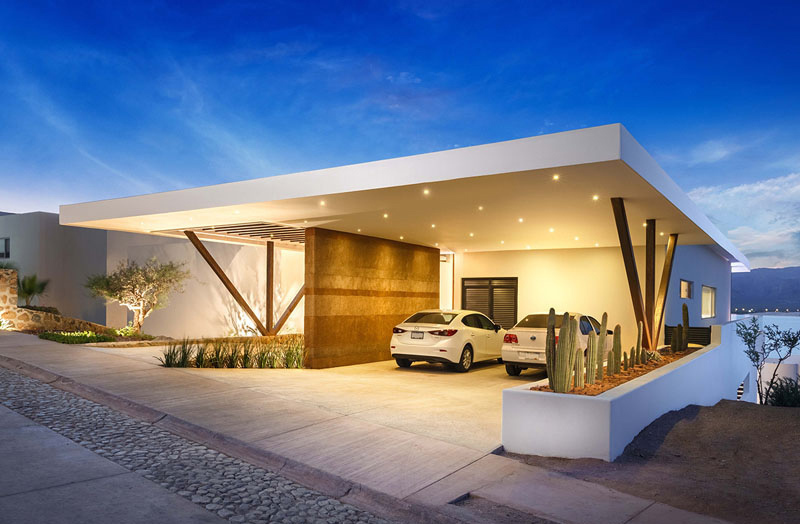 The carport is separated from the home’s entrance by a rammed earth wall. Admit it, you love this carport like we all do because aside from being spacious, it is light-filled and very relaxing. This path leads to the entrance of the house which has a customized wooden door design. Surrounding this part is the garden with various types of plants including some cactus. Inside the home, one will enter straight into the living room. Notice that there is a skylight in the staircase area and which brings more light to the interior. 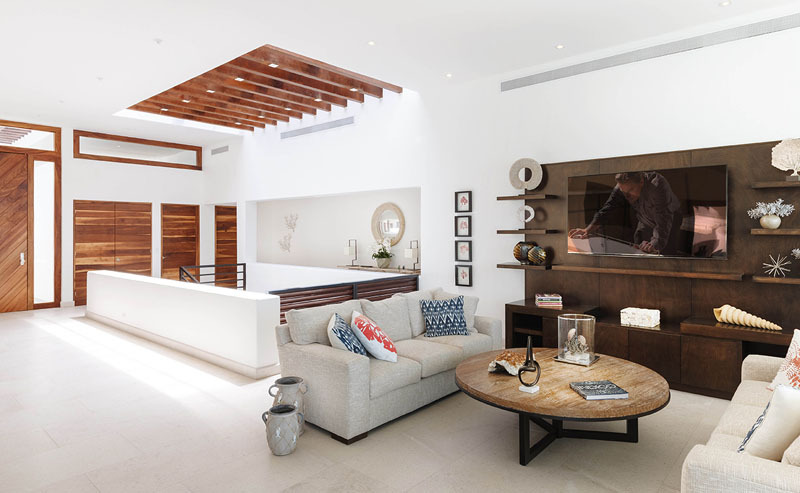 Meanwhile, the living room looks really stunning with a custom made entertainment system and a round wooden coffee table. 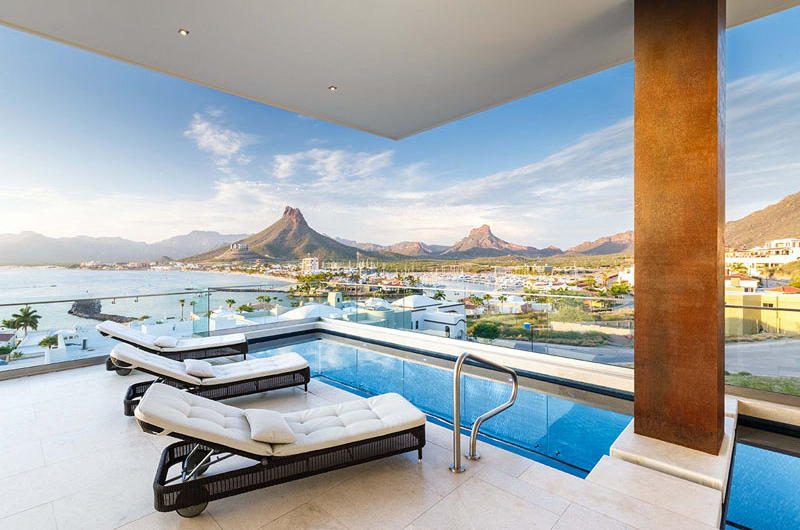 The living room also opens up to an amazing view, where a swimming pool and an outdoor lounge and kitchen are located. Isn’t this a very stunning view? It sure is! I would love to stay in this place if this was my home! And this is the pool area. It is just a rectangular pool free of any intricate styles but it does look beautiful. Even the view of the other houses near the area is also stunning. You can tell that homes built here have beautiful designs. But what I love the most here is the view of the mountains. 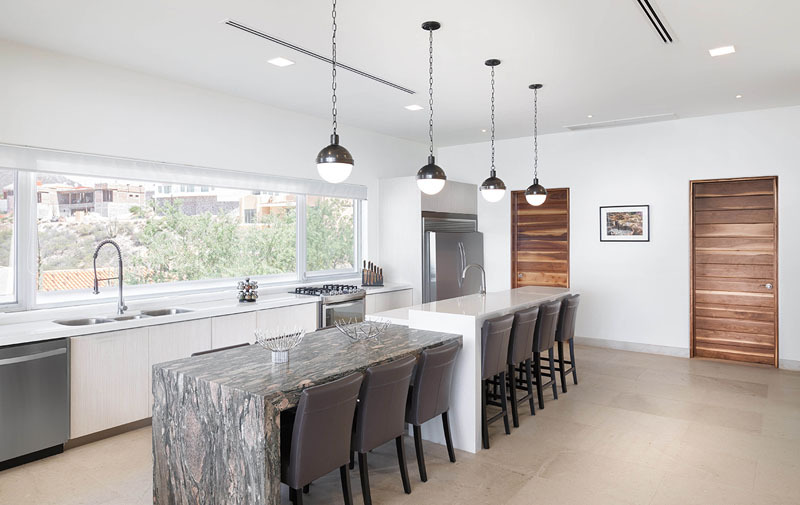 Back in the interior of the house, the kitchen has a large window running the length of the counter, and a dual-height island, providing plenty of space for meals and entertaining. 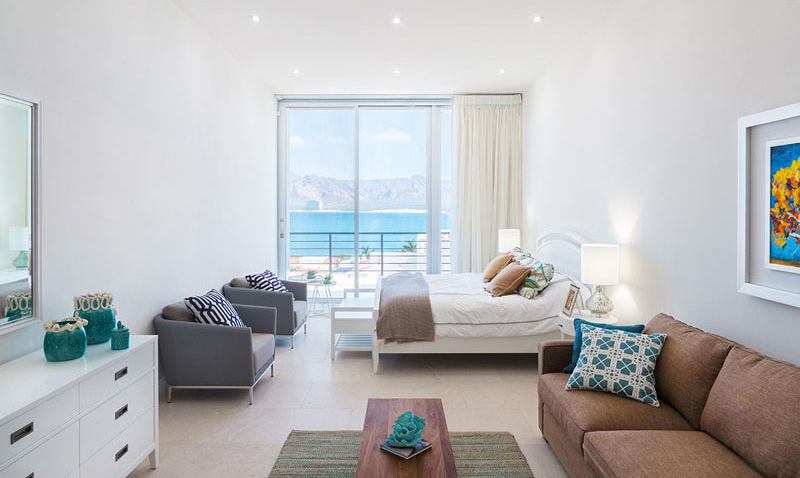 This is one of the bedrooms that have a balcony which once again shows off the view. The colors here are certainly cool combining white and blue. There is also a triangular glass table that adds an interesting appeal to the space. 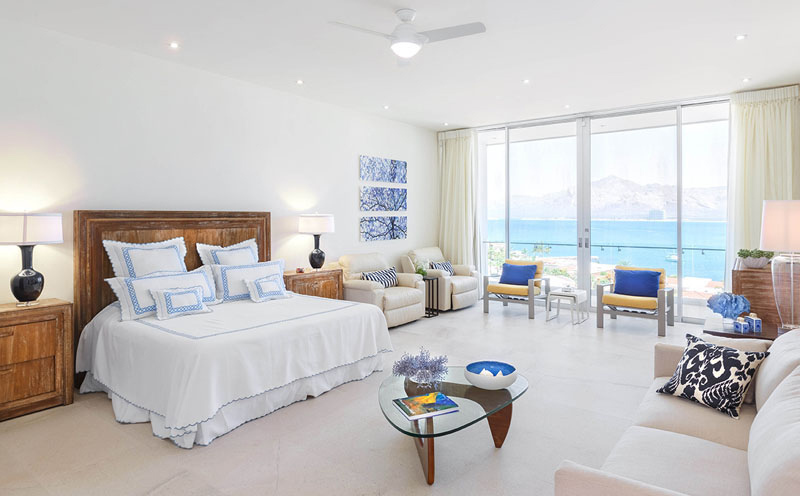 Another bedroom which also opens up to the balcony. Like the other bedroom, this one also has cool colors in it and some modern patterns. This is one of the bathrooms with a long vanity and a mirror that goes along its length. 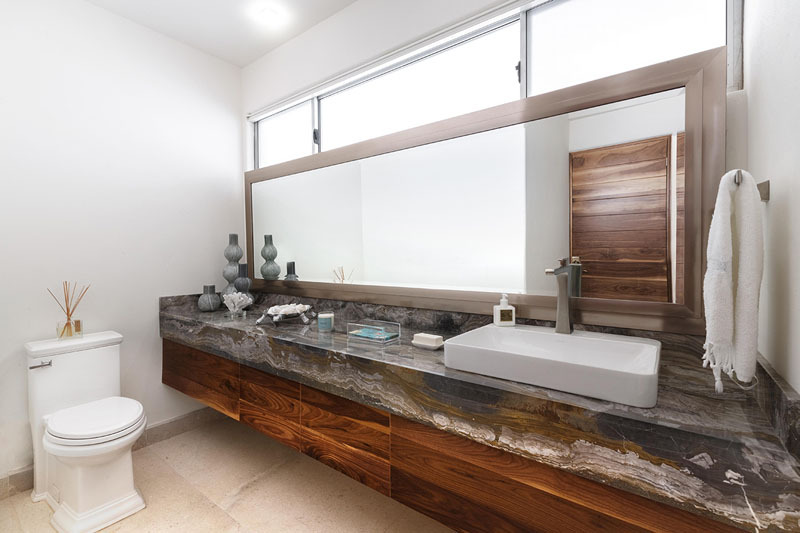 You can see how spacious this bathroom is and it is nice that some decors were added to the vanity. 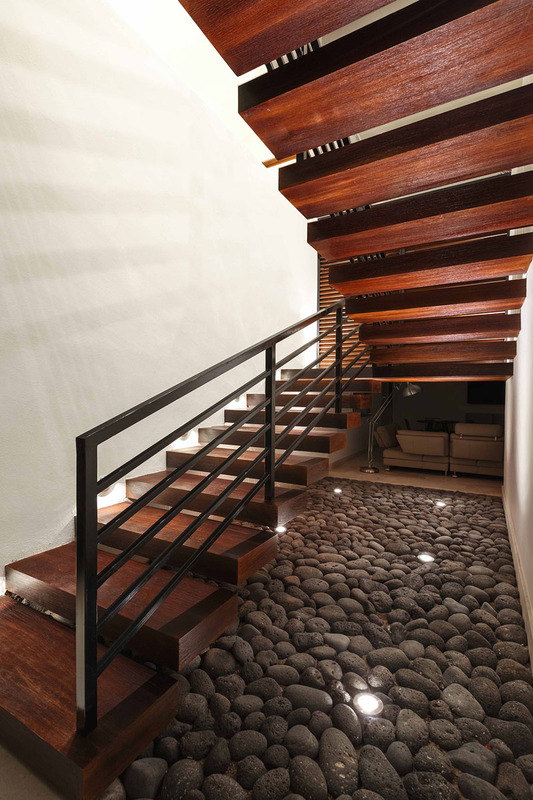 Dark wood and steel stairs are used in the house that leads you to the lower levels. It has stones under it which brings a natural appeal to the space. It is indeed a good idea to have stones here and some lights. Outside the house, there are several different access points along a stone pathway to reach the backyard. I like how they used steel for this part and how they added a lovely garden under it with some stones and gravel. It looks pretty dramatic as you look at the area from top to bottom. Creative landscaping was used to liven up a void under an overhanging section of the house. Isn’t this a nice way to use available outdoor space? It sure is and it definitely added appeal to the area. Really, when a house has natural elements in it, it looks nicer and even more beautiful. Because admit it, everything that is related to nature looks beautiful. 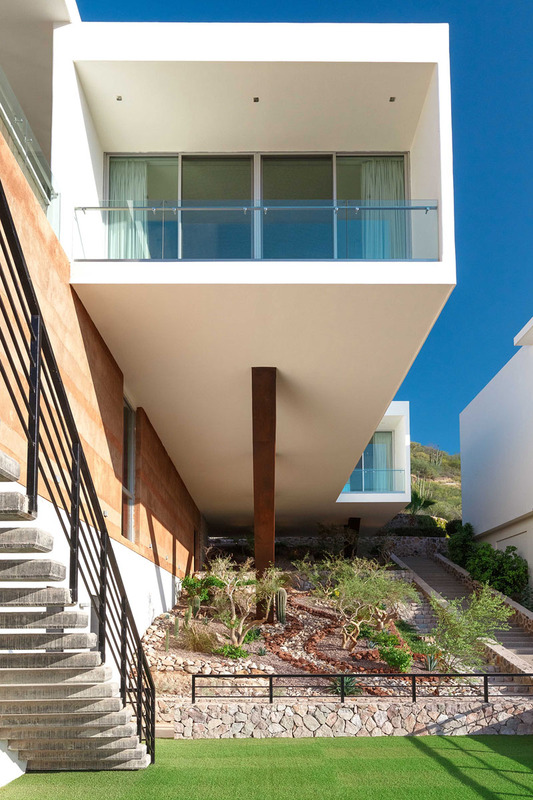 That is what made this house designed by Imativa Arquitectos more appealing. I love the look of the facade as well as the interior. The overall look of the home is really gorgeous. Despite the challenging lot topography, the designers were able to come up with a design that fits the need of the owners. They were also able to make use of the sloping lot in a very creative manner. And above all, the view from the house is very breathtaking!